It’s best not to plan an outdoor birthday party when your birthday falls in the middle of January and you live in Winnipeg, Manitoba, Canada. But I did it anyway. I was 10 years old. Then I spent the next several weeks praying it would be warm enough to have the party. I was so jealous of the summer birthday kids. Not only did they get sunny, warm outdoor parties, they never had to go to school on their birthdays! I really hoped that my own children would have summer birthdays…. Fortunately they did- one in July and the other in August. But summer birthdays come with their own set of complications, like not wanting to turn on the oven to bake a birthday cake because it’s too hot! 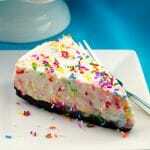 So, in light of this, I’ve had to come up with workarounds, like this No Bake Birthday Cake Cheesecake. I always ask my kids what kind of cake they want for their birthday and this year I found out that my daughter loves cheesecake and that my No Bake Rhubarb Cheesecake is her favorite! I actually didn’t know this. She said wanted a cheesecake for her birthday, so I started to toss around cheesecake birthday cake ideas. But to my mind, since it’s a birthday cake, I thought it needed to taste like a birthday cake. 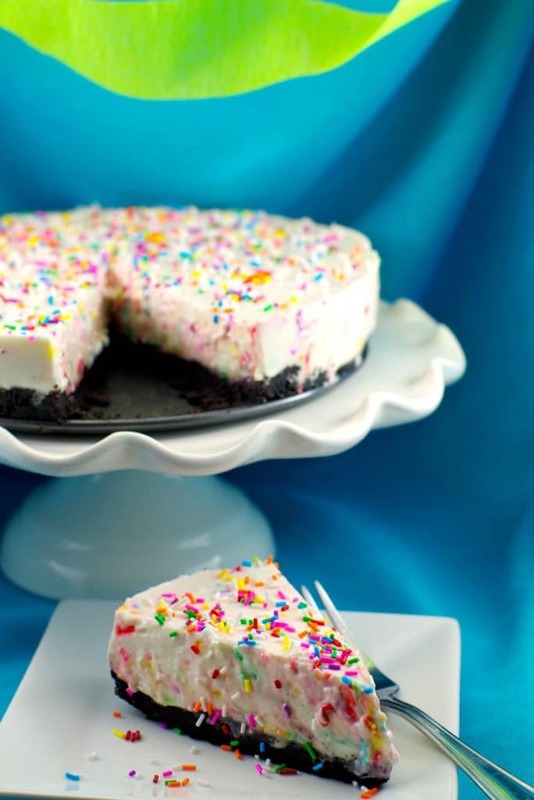 Enter cake batter flavor cheesecake! 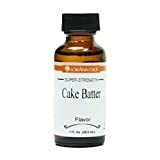 The taste of birthday cake is so distinct and it’s magic cannot be underestimated when it comes to celebrating a birthday. Lots of sprinkles make it even more festive and birthday-like! So, when I couldn’t find the type of cake batter flavored cheesecake I was looking for online, I decided to create one that would be exactly she wanted! 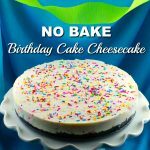 So, if you are looking for birthday cheesecake ideas, give this No Bake Birthday Cake Cheesecake a try! After I planned my outdoor tobogganing party, I spent several hours meticulously designing and individually coloring each of the party invites. Then, sadly, I had to cancel my party because the temperature outside was -50 degrees Celsius that day. Yes, you read that right MINUS 50! That made for one pretty depressed kid. Because having a birthday in January is depressing enough, when I grew up and started working, I decided I’d take the day off work for my birthday whenever I could. This really helped. But if there is one saving grace about birthday celebrations in January in Canada, it’s that you will never have to worry about it being too hot to turn on the oven and bake a cake! 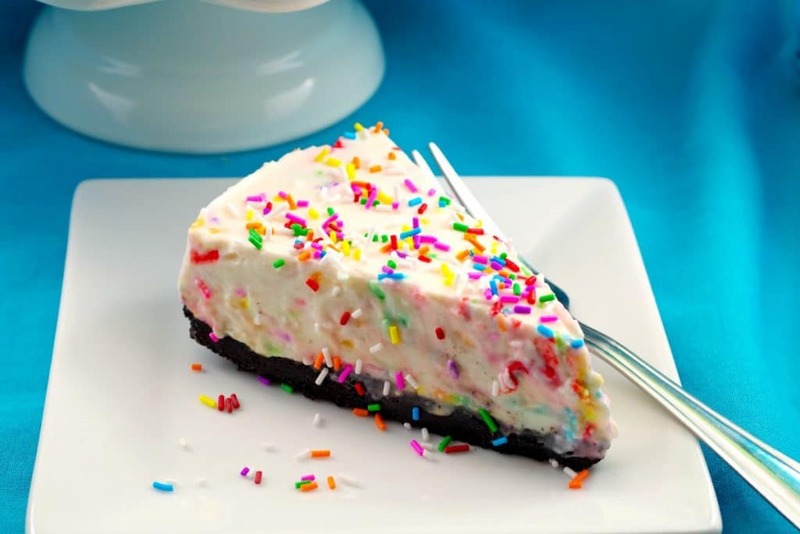 But if you want to make a no bake birthday cake, this Cake batter flavored birthday cake cheesecake, with all those colorful rainbow sprinkles, is sure to cheer up any birthday girl, even if her birthday falls on Blue Monday! 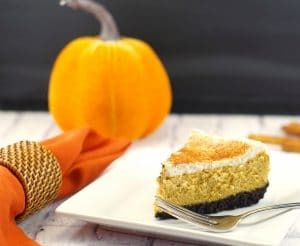 If you love cheesecake, you’ll also love this baked Skinny Pumpkin Cheesecake! 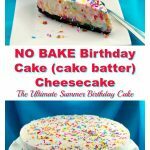 This easy no bake cheesecake tastes exactly like a birthday cake, but with the delicious, creamy and tangy cheesecake flavor and texture! 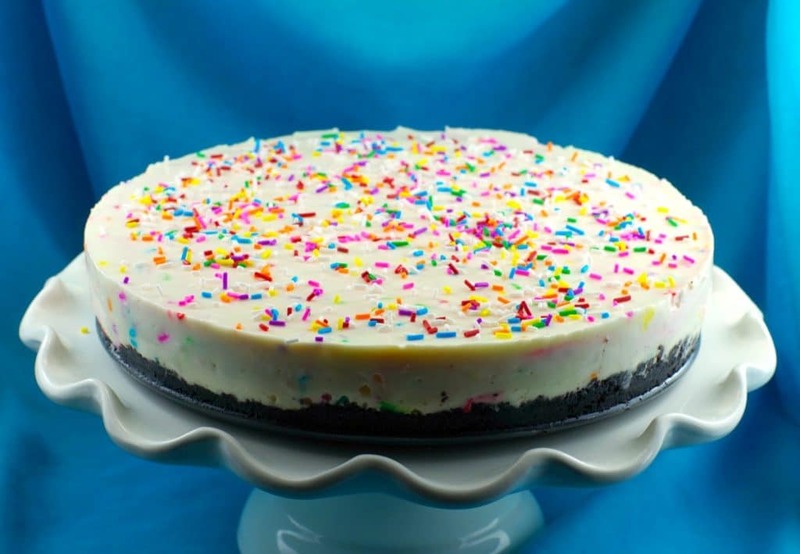 With sprinkles on the inside and outside and an Oreo cookie crust, it's the perfect summer birthday cake (that you don't even have to turn on your oven for). And it's the perfect cheesecake lover's birthday cake. * 13 Weight Watchers Freestyle Smart Points per piece and worth every single point! Spray an 8 or 9 inch springform pan with non- stick cooking spray. Combine Oreo cookie crumbs and 3 tbsp white granulated sugar. Add 2/3 cup melted butter and mix until all the crumbs are moistened and a thick, crumbly paste forms. Press onto the greased springform pan. Level and press to the bottom of the pan using a rubber spatula and neatly taper at the edge. Cover the pan with plastic wrap and place in the fridge for 15 minutes. Mix gelatin crystals and 1/4 cup water in a small bowl and allow to bloom for 5 minutes. Heat 1/4 cup water for 30 seconds in the microwave on high and pour into the gelatin bloom. Stir to dissolve, and allow to cool. Place cream cheese, 1 cup white granulated sugar in the large bowl of a stand mixer fitted with a paddle attachment (you can use a hand mixer and a large bowl). Mix on low to break down the cream cheese for 30 seconds, and increase to medium speed for another 1 minute. Scrape the sides of the bowl and add sour cream, whipping cream, Greek yogurt, cake batter flavour/extract. Melt the white chocolate in the microwave on 1/2 power for 1 minute, then check, stir and put back in to microwave for 30 second intervals. Ensure that you stir each time, as the stirring helps to melt it further. Then stir in the melted white chocolate into the cream cheese mix. Mix on medium for 30 seconds, scrape the sides, and on medium-high speed for 2 minutes, until smooth and fluffy. Starting on low, pour gelatin into the cream cheese mixture. Continue to mix at medium speed for a minute, scraping the sides of the bowl after 30 seconds. Gently stir in the rainbow sprinkles. Pour into the springform pan with crust and level with a spatula. Tap pan lightly against the counter to get rid of air bubbles. Cover with plastic wrap and refrigerate for at least 3 hours, preferably overnight. Unhinge rim of springform pan and remove. If necessary, smooth edges of cake with a knife. Serve. Garnish with additional rainbow sprinkles as desired. 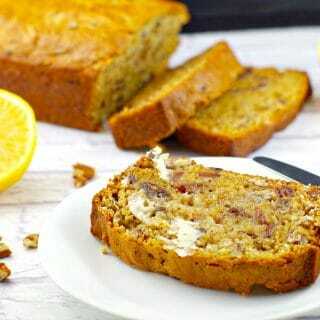 This recipe is part ofThe Country Cook’s Weekend Potluck! Previous Post: « Quick & Easy Pork & Beef Stovetop Chili: The Best Chili! This is such a Happy Birthday cake with all the sprinkles and such! Sprinkles definitely brighten up a January birthday! 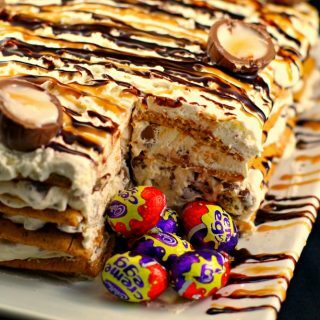 And no-bake is a bonus! I think you should always take your birthday off from work! Mine is in July and I always take it off! Thanks, Leanne! Yes, I guess no matter when your birthday is, it’s always nice to take it off work!